Fancy giving away some cupcakes to trick or treaters or perhaps just have a ghoulish treat for your halloween party? Then pop along to Elaines Creative cakes and see what we have in store for you. We promise that although the cakes will be ghostly and devilish, they will still taste divine! 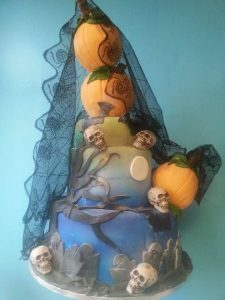 We use only the tastiest ingredients in our cakes to make them look ghastly for halloween and perfect for your little monsters. Contact us for some monster cakes!